GUIDE: What is PE Ratio? What Are PE Ratios Used For? PE ratio is the single most important stock trading ratio and something all fundamental analysts rely on. A PE ratio is used to calculate how much a company is worth and how long it will take before one gets their investment back. It’s also used as a basic concept that can be further developed into other ratios. The benefit of a PE ratio is that it can be used to compare different sized companies even if their earnings and profits are much different. Would you like to know more about PE ratios? Then this guide is for you. What Does the P and E in PE Ratio Stand For? Before we continue explaining how to best use the PE ratio and describe how to calculate a PE, we need to explain what a PE ratio is. PE is short for Price and Earnings, and it can be written as PE or P/E, and sometimes even as PER which is short for Price Earnings Ratio. How Do You Calculate the PE Ratio of a Specific Stock? In order to calculate a PE, you need access to the company’s stock price (P) and their earnings per share (E). All publicly traded companies are forced to be transparent with this information, and it is not hard to find. After you found the needed information, the calculation is straightforward. Your job is to divide the stock price with the earnings per share, and the sum is the PE ratio. It is a piece of cake and to further clarify how it works we’ll use Google’s stock as an example. In the first image below you see how much the Google stock sold for at a certain time. 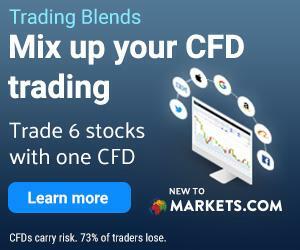 The price data was provided by Markets.com – one of the leading CFD brokers on the market. 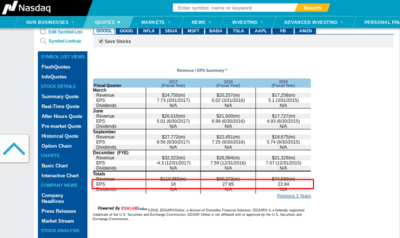 In the second image, you see an example of Google’s earnings per share (EPS) directly from the Nasdaq exchange. To calculate Google’s P/E we take the stock price from the first image = $1,002 and divide it with the EPS from the second image = 18, and the result is Google’s P/E. That means Google has a PE ratio of 55.6 based on the current stock price and the average earnings per shares from 2017. Note that PE ratios are calculated on a yearly basis which means you can either use the EPS from the past 12 months or an estimated EPS for the coming 12 months. What Are PE Ratios Used For? Generally speaking, there are two main usages for PE ratios. Firstly, one can use a PE ratio to estimate how long it will take before you get your investment back. The calculation is based on the assumption that the company will continue to grow at the same rate, and if the company starts growing faster, you will get your money back sooner. However, if the company’s revenue slows down, you will have to wait longer for your investment. In other words, a PE ratio mirrors how well a company is doing. In addition, a PE ratio can be used to estimate whether a stock is over or undervalued. All stock exchanges have an average PE ratio, and a company that’s above that number is generally overvalued, thus a questionable investment. At the same time, a company that’s under the same number is undervalued and possibly a good investment. That being said, under and overvaluations are not always accurate. A large and well-established company will often grow slower than a newer company, and you shouldn’t focus all your attention on these projections. Also, companies in different industries have different ratios since industries work differently from each other and are affected by their own external forces. What we’re trying to say is that two stocks don’t provide the same investment potential just because they have the same PE ratio. Due to this, we recommend that you never use a PE ratio to compare businesses in different industries and that you always combine the PE ratio with other analytical procedures. As mentioned, a PE ratio can be used to evaluate whether or not a certain stock is a good investment. The calculation is based on a company’s earnings and growth and can be used to compare different companies with each other. Naturally, this means that calculating PE ratios is an important part of any investment strategy. However, it’s up to each and every one to decide how to interpret a PE ratio and what to do with the information. Some investors prefer investing in companies with high PE ratios while others rather invest in companies with low PE ratios. In the end, it is all connected to the type of strategy you’re using for your investments. Investors also combine the PE ratio with other important ratios such as the PS and PEG ratio which we’ll talk more about in a second. What Is The Connection Between Market Value and PE Ratios? A PE ratio can be used to calculate how much the market is willing to pay for a company and give you an idea of a company’s market value. You do this by multiplying a company’s PE ratio with the revenue. Let’s say a company has a PE of 2 and a revenue of $20 million. That means we multiply 20 million with 2 and get a market valuation of $40 million and that shows us that the market would pay $40 million to buy the company. Sooner or later you’ll run into the expression ‘negative P/E ratios,’ so we thought we’d explain the concept for you. A negative P/E ratio comes from companies that aren’t making a profit. However, negative P/E ratios only exist in theory since profit is needed to calculate it and you can only calculate estimated P/E ratios for companies that are not profitable. By using a company’s estimated profit one can calculate an estimated PE ratio, but this number is not as stable or accurate as a regular PE ratio. We’ve already mentioned that there are more ratios than the PE. We’ve written detailed descriptions of the most important ones as well as a guide on how to use stock ratios, and below you can find short descriptions of them. What is a PS ratio? A P/S (prices to sales) ratio is similar to the PE ratio however instead of using a company’s profit you use the company’s revenue and market cap. To calculate the PS ratio, you take a company’s revenue and divide it by the market cap. A PEG (price/earnings and growth) ratio is used to calculate a company’s worth compared to its growth rate. To get the PEG ratio, you take a company’s PE ratio and divide it by the growth rate. Ratios such as PE, PS, and PEG can either be used on their own or together depending on your strategy. Just keep in mind that you shouldn’t base your investments solely on ratios and that there are other important factors to consider when buying stocks.